I have only been in Vietnam for a few days but I am already wondering how it took me so long to get here in the first place. Granted, I’ve just arrived and I am in Saigon**. The country’s geography is so stretched vertically and its history so tangled between north and south that there are little generalisations to be made, especially when I’ve only visited one city. 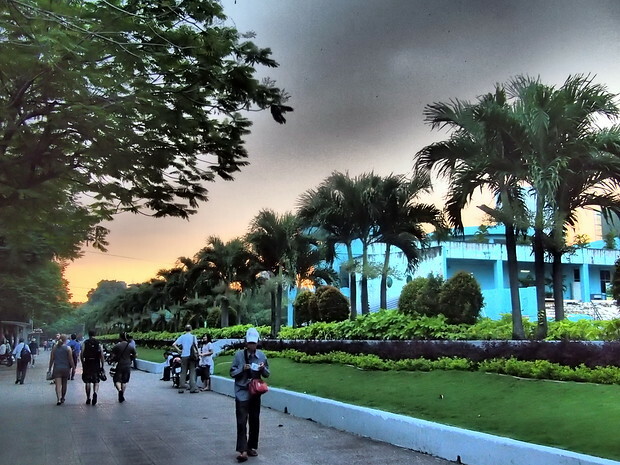 My first impressions of Vietnam lead me to believe that I will enjoy my months here tremendously. The food, the language, the people and the fascinating quirks that separate it from what I am familiar with – i.e., the rest of Southeast Asia – will make for a very interesting winter in Vietnam. I’m writing this post from my apartment, a $350 a month serviced studio in a tiny building off a quiet alley in District 1. From the window, a nearby choir practices songs, with the nonstop honking from the main road only a distant echo here. Much like my temporary home in Bangkok, the apartment is in the heart of the city but yet strangely buffered from the chaos just at the end of the street. Birds wake me up at dawn – thankfully no myna birds within earshot – and it’s a leafy, quick walk to the main road. I came here in part to be productive with all the work I have to do; being able to get writing done in a quiet home space is a wonderful thing and I’m thankful to have it available. 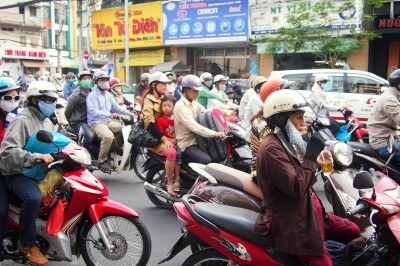 ** Note: people have asked why Saigon and not HCMC. I’ve used both, but asking around to Vietnamese friends, they too use Saigon. I’ve heard both in my short time here. For first impressions, let’s start with the food. 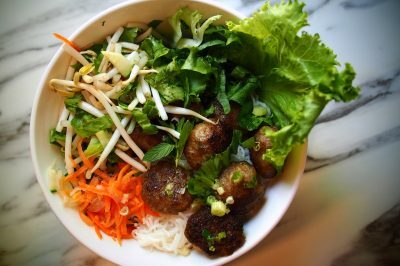 I’ve long loved Vietnamese eats, pouring over the Wikipedia entry for the country’s cuisine well before I set foot in the country. 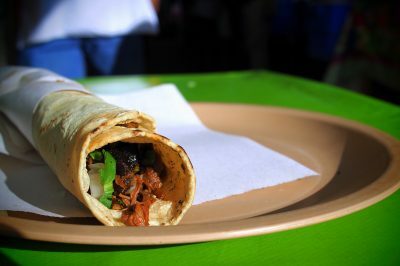 It’s one thing to long for food from afar, but another to eat it in-country. What we call “Chinese food” in North America is rarely like food in China and besides the regional differences in food preparation and ingredients are so disparate in the country that there really isn’t such a thing as “Chinese food” at all. 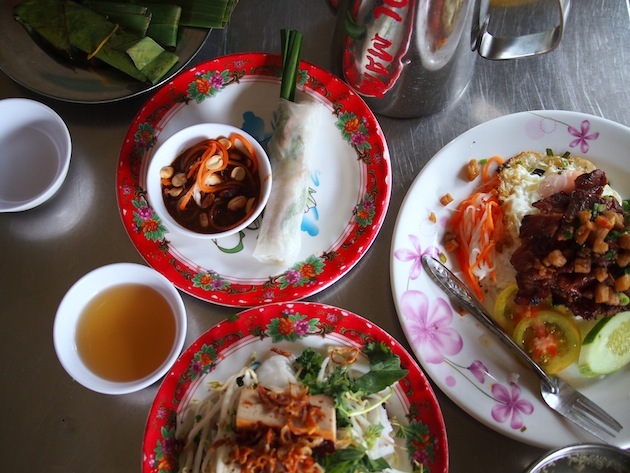 Like China, the food in North, Central and South Vietnam is different one from the other, though each region does have restaurants from elsewhere in the country. I started off my culinary adventures with a bowl of Saigon style pho (phở Sài Gòn) and have been trying to eat at least one new dish a day. As goals go, it’s an easy one to accomplish. Saigon has packed, narrow restaurants from a variety of regions, some setting up in alleyways (called hem here, instead of sois in Thailand) and others squeezed between shops and schools. The next alley over there is a “snail and beer” joint where you pick out your snails, clams or prawns and they cook them for you. At the end of my alley, a rice place packed to the gills at lunch, serving a plate of white rice with choice of meat and vegetables, from crispy pork to sweet, caramelized cod to braised eggs. 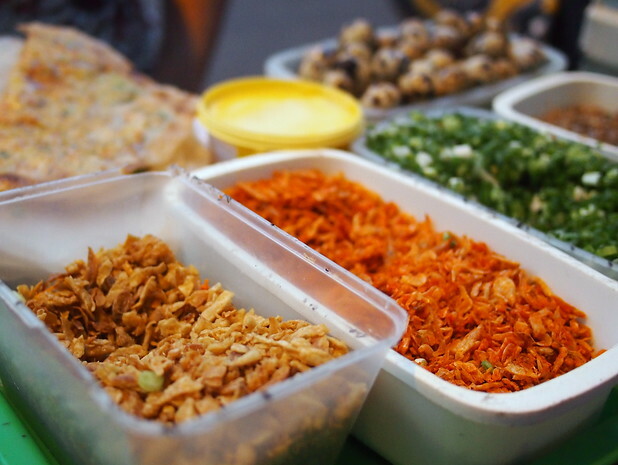 Much like Indonesia’s nasi campur, it’s an “everything and rice” kind of restaurant, $1.10 a plate and the best thing to do is go back and try a new topping for your rice each day. Everything I have eaten thus far has been fantastic, many of them served with a heaping bowl of green herbs (rice paddy root among them), and no meal has cost me over $3, with most ranging from $1-2. Pho Saigon, with more herbs and a plum sauce that isn’t found in its northern version. 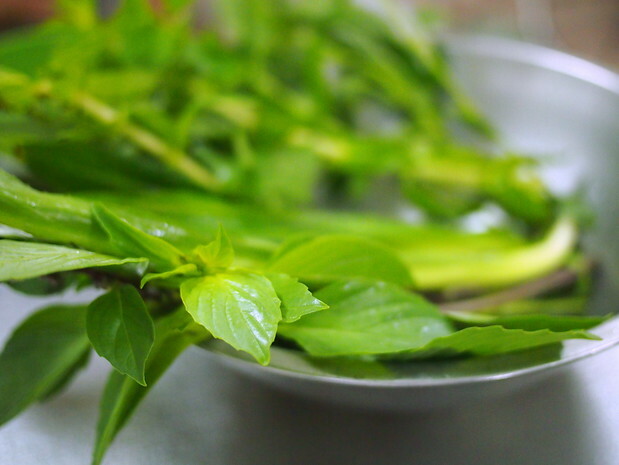 Pho herbs – mint, rice paddy (yay!) and basil. 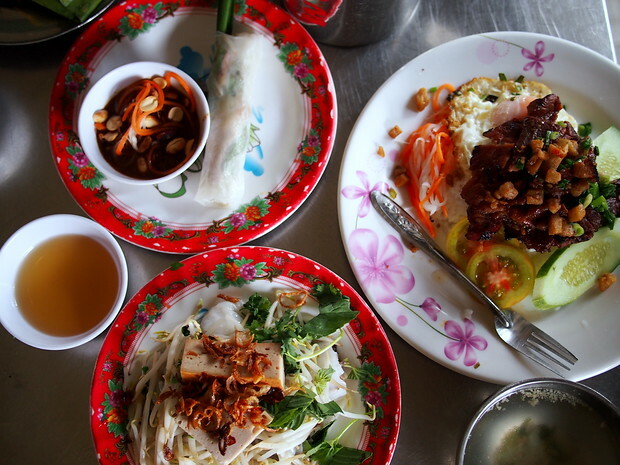 One of my first meals with friends – banh cuon, summer rolls, grilled pork with egg and rice. 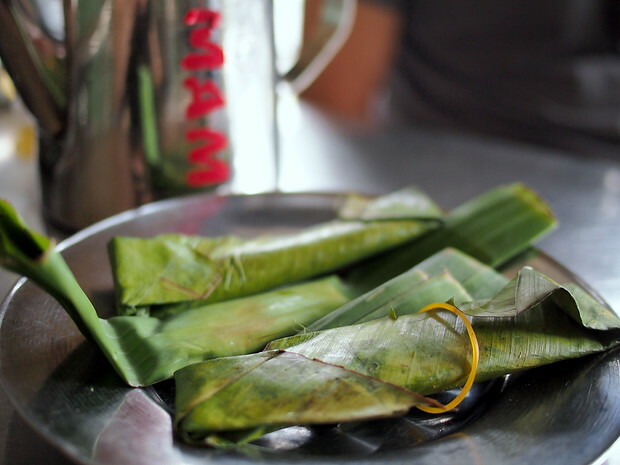 Fermented pork wrapped in banana leaf, not your usual pre-appetizer. 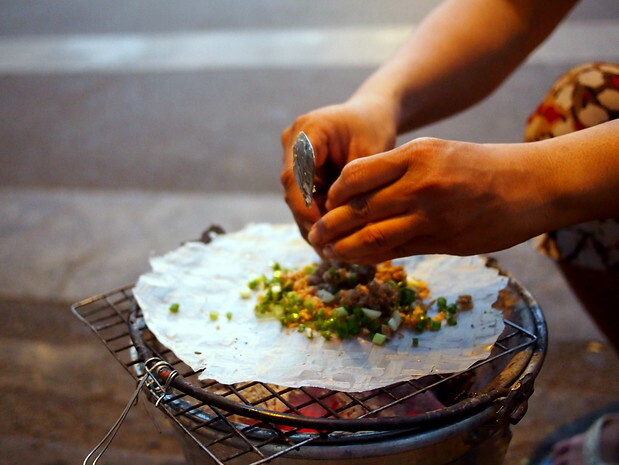 Banh Trang Nuong – great street food option. 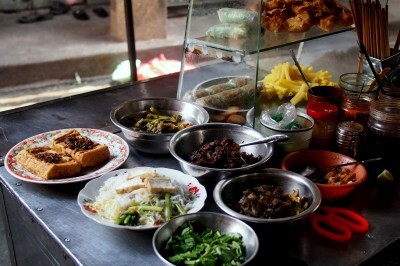 Ingredients for Banh Trang Nuong – pork, shrimp, green onions, fried garlic and a quail egg. 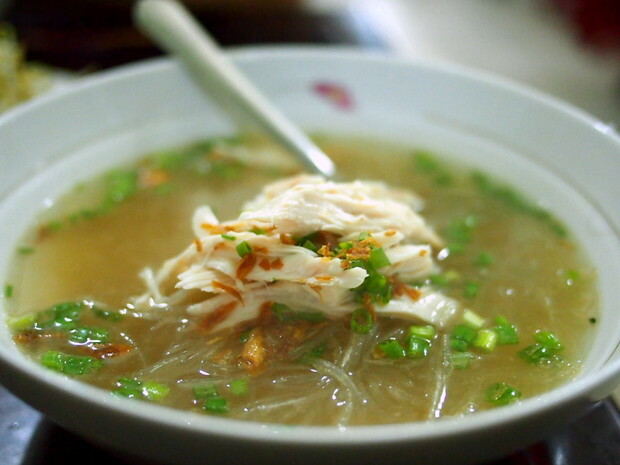 Mien ga, a chicken soup with glass noodles made out of canna flour (a plant), and gluten-free. 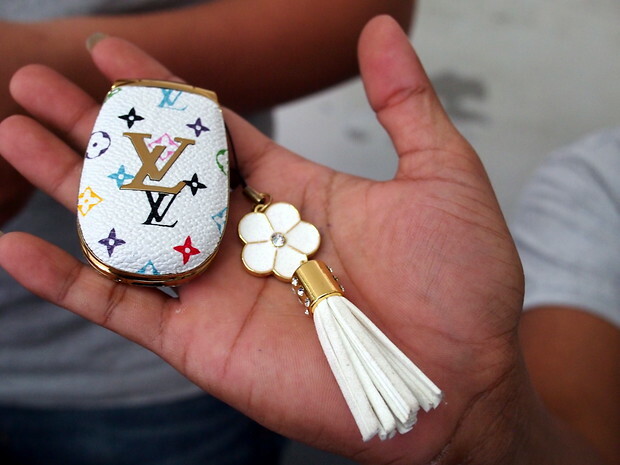 Louis Vuitton phone, as cheesy as it gets. 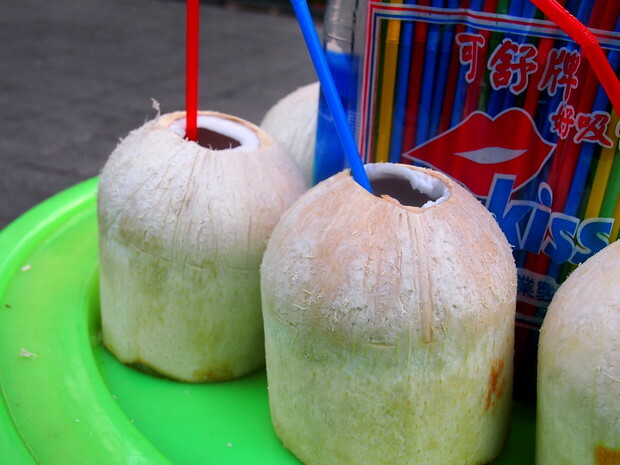 50 cents for a fresh coconut. There are, however, some very interesting differences. For starters, there is the staring and the waving. 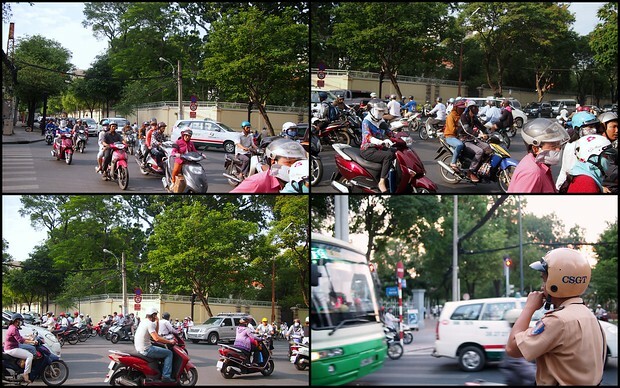 In my years in Thailand I never had people waving at me from their motorbikes, especially not in a large metropolis like Saigon. 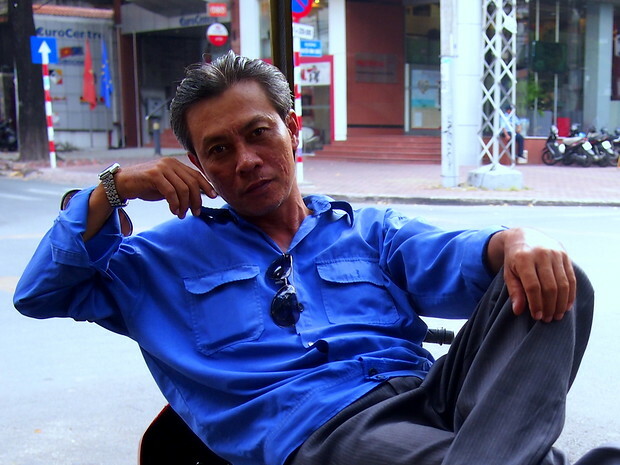 In Chiang Mai or in Bangkok, people ignored me wandering around – they were friendly, but only when smiled-at or when a conversation was in place. Saigon has been a strange otherwordly experience of staring, waving, hand-holding (from women only, of course) and comments about me being small and “Vietnamese-sized”. I found similar reactions to my size in Myanmar (the most memorable there being the “did your mother feed you as a child?” question – yes, yes she did! ), but never elsewhere in the region. It’s been only a short time, and I’m curious if it stays this way. 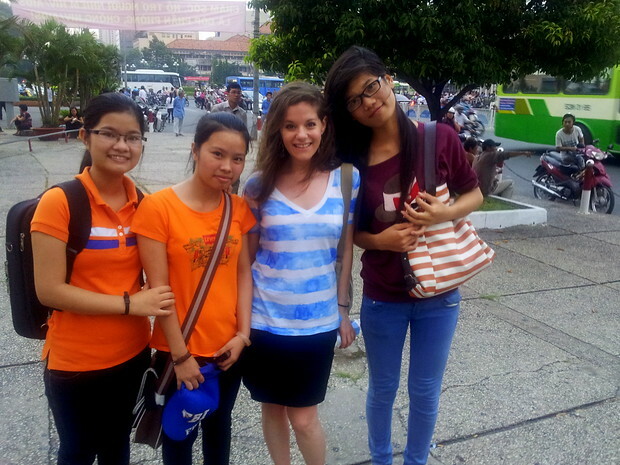 These girls asked to take a photo with me when I was wandering in the park – never happened in Thailand! The motorcycle taxis here do not wear vests like they do in Bangkok, but they are required to give you a helmet – another change. (A positive one too.) They also sit at the side of the curbs, propped up and waiting for their next customers. It’s a wonderful sight, the drivers stretched out lazily and casually watching people go by. I found this driver to be particularly photogenic, and he welcomed me to take a portrait. 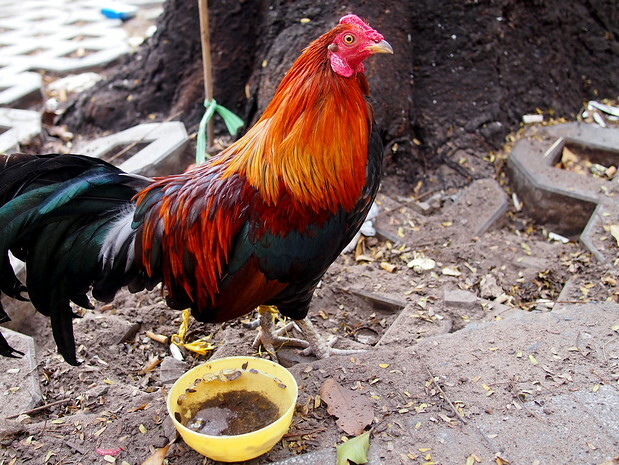 Many more urban roosters outside the market areas, with feeding bowls and collars. I’ve seen chickens and roosters wandering market zones and towns throughout my time in Southeast Asia, but only in the Philippines were they prevalent in the main cities, likely kept for cockfighting. The parks here are packed, absolutely packed, as soon as school and work lets out. From late afternoon until 10pm at night, people are sprawled out on a tiny patch of grass, eating snacks, drinking tea and generally socialising with friends. Families bring their young kids, students bring other students and everyone seems content to sit in the green spaces, enjoying the cooler air. While there are some great parks in Bangkok, they tend to be quiet after 6-7pm, whereas here that is when they really pick up. Sunset over one of the many green spaces in the city. Since it’s Christmastime, I’ve been afforded a look at another quirk: the fact that as soon as the lights go up in downtown Saigon, people spend their evenings taking photos in front of the Christmas trees and window displays. Not “a few people” – thousands of people congregate on the downtown core and post in fancier clothes in front of stores, trees and wreaths that wrap the many buildings near the Rex and Sheraton Hotels, the bigger malls and the Opera House. No photos yet, but I will definitely take a few in the coming days, especially since I’ll be here through the holidays. I’ve had several people ask why I am using chopsticks with my left hand. I took out a pen to show that I write with my left hand, which only caused more confusion. This was in smaller market stalls, but interesting to note regardless, as I’ve never had comments like this outside of Malaysia and Indonesia. Finally of course, the traffic. The traffic! People warned me about it but it’s true, the traffic is incredibly frenetic, with honking all day long and motorbikes and cars all moving almost in a trance, gliding through the intersections in some intricate dance where somehow they (mostly) escape the chaos unscathed. I’ve put together a photo, but for a real glimpse, check out the video I embedded at the end of this post – it’s magic. Differences aside – and I’m sure there will be many, many more since I did just arrive here and am still shaking off jetlag – I’m also lucky to have friends in town. James and Will, who I last saw in Chiang Mai and Girona respectively, are both here for a while, and it seems that in the coming weeks and months many others will be passing through the city. I’ve met other writers and expats in my short time here and look forward to learning more about the country through them. I’m happy. It’s a gift to be able to choose where you want to live for the next few months, and I’m thankful to have decided on Vietnam. I’ve been having mixed feeling about visiting Vietnam due to the varying disparity of opinions on traveling there. That being said, your post has nudged me slightly further into the ‘make sure I definitely visit’ column. I look forward to keeping up with how your trip goes. Also, that video was amazing thanks for sharing. Oh, and your photos have made me hungry now. I’m Vietnamese born (haven’t been back in 18 years) and I have to say: you did a good job describing the food/people/country. Keep up the good work! I want to travel there just for the food. Those photos make it look so delicious! I’ve wanted to go to Vietnam for so long, but somehow other countries just manage to sweep in in front of it every time I travel. I really hope to go this year! If Vietnam is anything like the time I spent living in southern China (as it sounds similar) you will definitely hear more comments about you being left handed as well as your size. The waves and staring will probably stay as well! I’m looking forward to reading more! Wow! 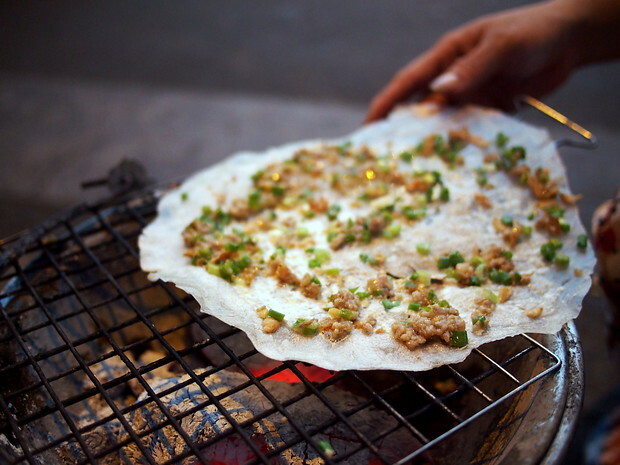 I can’t wait to get the and try the street food. Just working my way through Cambodia now. Cheers! if you have time, travel to the central coast and the central highland. you will like it there. Thank you Rubin! I’m not sure how much travel I’ll get to do this visit but I do plan to be back. Hi Judi, so glad to know that you enjoy Saigon. Have you tried fish/chicken noodle at this place? 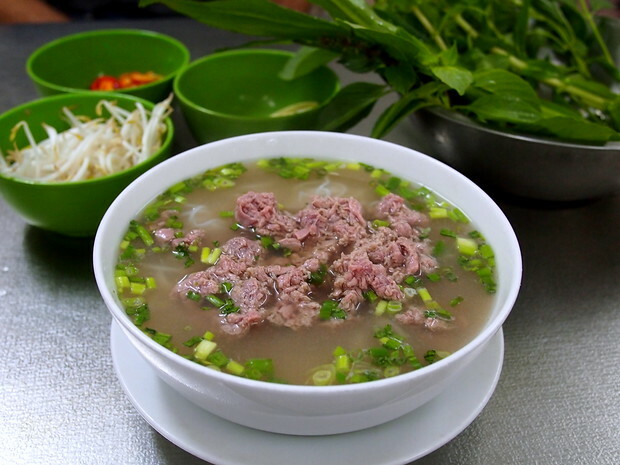 http://gastronomyblog.com/2011/12/06/hu-tieu-ca/. Address: 43 Ton That Dam. I’m sure you will like it. Remember to dip the pork pastries into noodle’s soup, it tastes like heaven! But you have to go before 9am for breakfast or 7-8pm for dinner coz it runs out pretty quickly. Love to hang out sometime so if you need an “eating mate” just contact me. Mouth watering. I’m so ready to visit Vietnam again. I’m so tired of all the high fructose corn syrup in everything here in the US. saigon is always the original name. after the communist victory in the south in 1975, they renamed saigon to ho chi minh city. 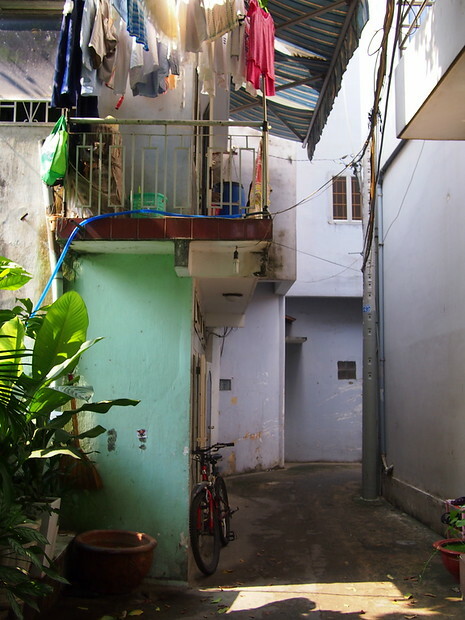 local people still call their city saigon though. Om nom nom. You had me at crispy pork!!! I’ve been to Vietnam twice but was a vegetarian both times so feel like I really missed out. I need to go back as a carnivore and indulge. This lawyer wants to travel with you!! Great blog! Im glad you discovered my motherland and enjoyed the beautiful cuisine. I’ve been following your blog and your travels. Love your photos. I’m so jealous you’re in Vietnam, I absolutely loved it there. Especially the food. If you make it to Hanoi you must go to this restaurant called Cha Ca La Vong, they serve one dish, steamed fish with rice noodles in the most fragrant and delicious herb sauce. I promise, everyone I have told to go has loved it. they actually opened up one place in NYC where I live in Brooklyn that serves this dish. It’s incredible!!! Thanks Katie. I can’t eat the turmeric and dill fish as it is first dredged in flour and I have celiac disease. 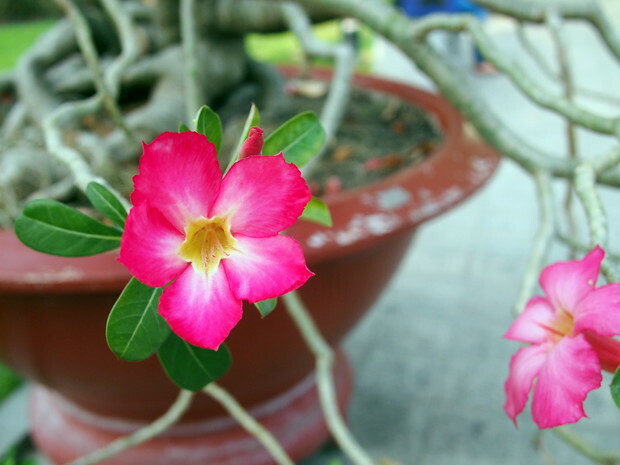 I am glad you enjoyed your time in Vietnam. I love Vietnam! The reason left-handedness is so odd there is because if you are left-handed, they make you learn to be right-handed! My mom is Vietnamese and she is left-handed but does everything with her right hand. Enjoy! 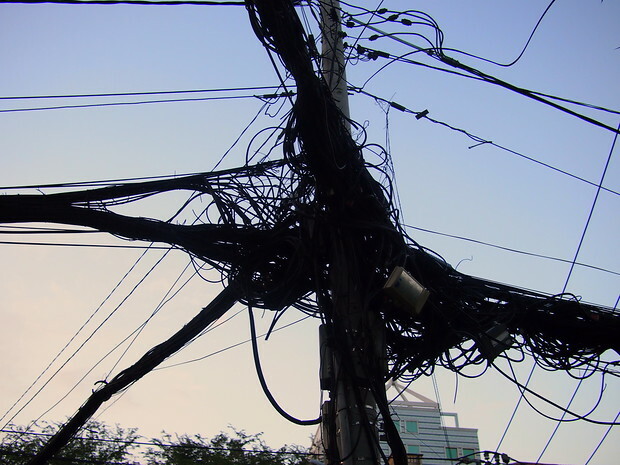 You’ll never understand Vietnam or its people. Get back to your privileged life in the west. Eh, I quit my job years ago so there’s no such set up life in the West to go back to. Your IP is from Australia, which makes your comment even more strange. In any event, not sure why you’ve left such an angry comment on a wholly innocuous post. Have been following ur blog for quite awhile & very inspired by your solo travelling style. i myself will be heading to saigon very soon but more for overseas work posting. i see that you’re living in district 1. Can i check how it’s like living in district 1? im contemplating bwt district 1 n 3 but i cant decide. Hi Michelle! District 1 is more central than District 3 (you can walk to most of the main sights), but it’s quite touristy near the Pham Ngu Lao area. I live near the French Consulate and it’s quite a bit more local, but not as local as District 3. If you’re looking to immerse yourself, D3 would be a good bet, but if you want to be proximate to more of the cafes and bars where expats and tourists would also visit, then D1.